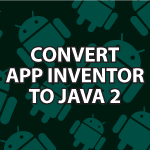 In this video I will finish up converting my App Inventor app into regular Java. If you missed the first video you must watch it first. Not only will we finish the app, but I’ll also show how to install Ai2LiveComplete, which is a version of App Inventor that adds a ton of additional functionality and also doesn’t require an internet connection. The full list of what we will learn and the code follows the video below. Here is the Bridge API I mentioned in the video. when I open WinStartAIServer on windows, it closed immediately. How to fix that? That almost always means your path isn’t set up. I cover how to fix that in the video. I have a Java tutorial here. I’ll also review Java again in my new Android tutorial. I tried to run your zombie code under my enviroment, but I have one error message from the AndroidManifest.xml file. It said the can’t find Theme.NoTitleBar.Fullscreen in the style file. You have upload your style file as well. Please ignore my previous comment. I found a typo error in my AndroidManifest.xml file. Thank you so much for all the time and hard work to share your work, and knowledge. I’m very appreciate a lot for your tutorial. I have learned so much stuff from your site. You have to the best Android tutorial on the youtube. Your teaching method is step by step, and easy to follow. Once again, thank so much for providing free education. I’m glad you fixed it. Sorry I couldn’t help. You’re very welcome 🙂 Thank you for visiting my little blog. Hi Derek! thanks again for your tutorials! please ignore my previous message, i figured it out! I have been trying to follow your Zombie App tutorial, but when I try to compile it, the app immediately closes with ‘Unfortunatly Zombie has stopped’. Hi Philipp, The best thing to do is to copy and paste my code. Make sure you have all the imports in your code. I run this on my Andoird device, but the screen is black. How do I fix that, I can hear the Moan sound when I press the screen, I have added all the images in the res/raw folder (created the raw folder) and added it to the device I can see on my screen. But why it does not show up on my phone I cant figure out. I ran the simple HelloWorld app, and the screen shows the text. Just now sure why it doesnt do that on mine. Sorry, but I’m not sure. Have you tried making an app that shows only the image to narrow it down?